ALZip is a program that, if used properly, can be compared with the more professional developments of its category. 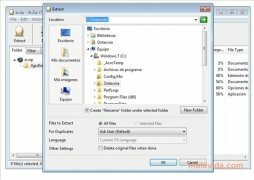 It is a file compressor/expander with a simple interface, that provides various utilities and tools that have been developed to make life easier with compressed files. 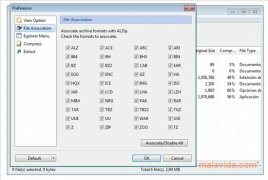 The program is compatible with more than 40 different formats among which it is worth highlighting the following: ALZ, ZIP, ACE, 001, XIP, BZ2, JAR, ISO, LCD, MIM, RAR, PAK and TGZ. 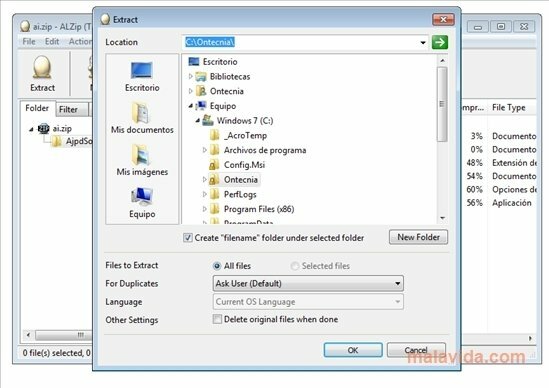 It has a system that checks the existence of any errors in ZIP files, a tool to repair corrupt files, capacity to integrate your antivirus in search of any threat, a system to establish passwords using AES-128bit/AES-256bit encryption and an option to split a compressed file into various smaller smiles. The program's graphical user interface is somewhat comical due to the icons that it includes, but that doesn't mean that the program is less powerful. Download ALZip and discover a powerful program to compress files. The trial version can be used freely for 60 days.